How to Exercise From Home And Start Enjoying The Benefits! So, you’ve made the decision to start working out from home… congratulations! You will soon be enjoying all the benefits of exercising from the comfort of your own home: no commute, no membership fees, no waiting in line for a bench. So let’s discuss a few pointers on how to exercise from home and how to turn your home into a gym you can be proud of. When most people think of a typical gym, they think of a huge warehouse full of workout equipment. Rows of cardio machines, rooms full of resistance machines, a free weight area, classrooms and what not. Most of us are probably not rocking that type of setup in our home (but kudos to you rockstars that are). Doesn’t mean you can’t have all the equipment you need to work out effectively from home. First of all, you need a few square feet of open floor space. Nothing huge, honestly most exercises can be done in an 8’x8′ square. Personally, I am lucky enough to have a corner of an attic for my home gym… the kids have taken over the rest, every day it feels as if my little gym gets smaller and smaller…anyway I regress, that’s a story for another day. But seriously, almost any bodyweight exercise can be performed in a few feet. Think pushups, sit-ups, squats, pull-ups, lunges… all great exercises that take very little area to perform. I love bodyweight exercises, you can get in great shape with these alone. But I will admit I get bored easily with routines. I like options. Having some free weights and a bench opens up a whole new world of opportunity with your exercise selection. 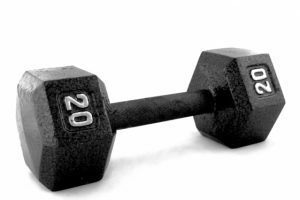 Dumbbells will typically take up less real estate than barbells, but if your gym space (and finances) allow for a barbell set than I say go for it. Bands, swiss-balls, medicine balls, ab-rollers, pull-up bars are all options that can be used in the home easily without taking up too much room. I have a dumbbell set that goes from 5-60lbs, a flat bench that can incline, a set of bands, and a swiss-ball. I used to use a pull-up bar, but I’ve been dealing with a case of medial epicondylitis that makes pull-ups a little painful these days. Some folks might be wondering how cardio is possible at home. 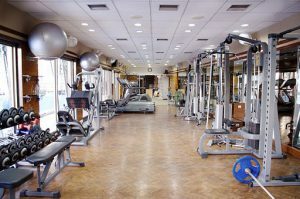 Treadmills, ellipticals, stationary bikes…all great options if you have the room and money… but not necessary. Trust me, doing the right total body circuit can give you all the cardio you can handle. That said, I’m kinda thinking about investing in a stationary bike (if my wife will let me put it in the attic…), some mornings I think it would be nice to just workout on the bike while watching some tv. But for now, I’m happy to be able to workout with the equipment I do have. I like to switch between bodyweight exercises and resisted exercises with the dumbbells, keeps it interesting. We will be discussing some specific workouts in upcoming posts. You could also invest in a home gym machine. These products offer an all-in-one gym experience, allowing the owner to perform a total body strengthening workout with just one piece of equipment. There are some really nice options on the market. For a comprehensive buyer’s guide, click here. So, find some space and open up your own “home gym” and start enjoying those perks! Hit me up with any questions or comments on equipment you would suggest for the home. Burpee: The Best Exercise From Home?